The GMC brand is one that has long been synonymous with quality and reliability. But why can’t a working-class vehicle sport refined luxury too? So what is the GMC Denali trim and what does it bring to each vehicle in the Denali family? Larger wheels, a dual-outlet exhaust, and extra chrome detailing highlight the exterior of the Terrain Denali while a slightly larger engine adds some flare under your feet as well. Additional exterior features include a hands-free liftgate, front fog lamps, and LED headlights. See the 2018 GMC Terrain for sale in West Palm Beach, Florida. A Denali upgrade on the Acadia model means getting many of the same luxuries described above. But the engine upgrade is even bigger, going from a 2.5L four-cylinder at the base Acadia to a 3.5L V6 with the Denali, which equates to a horsepower increase from 193 to 310. See the 2018 GMC Acadia for sale in West Palm Beach. Magnetic Ride Control highlights the Denali option of the Sierra 1500 while things like heated and leather-appointed front seats and LED headlamps become standard. A navigation system joins the touchscreen display along with wireless charging and a Bose Premium audio system. See the 2018 GMC Sierra 1500 for sale in West Palm Beach. The Denali announces its presence loudly in the Canyon, with a unique chrome grille, chrome door handles, 20-inch wheels, and large Denali badges. Inside, black leather, aluminum, and wood trims, and stitched soft-touch surfaces remind you that you’re riding in an upgrade. See the 2018 GMC Canyon for sale in West Palm Beach. Power running boards that lower when the doors are opened, 22-inch aluminum wheels, and a revamped grille only begin to tell the story of the Yukon Denali. Leather seats that are heated, ventilated and accented with ash wood materials provide the foundation for a ride on a 10-speed transmission similar to that of a Camaro. See the 2018 GMC Yukon for sale in West Palm Beach. 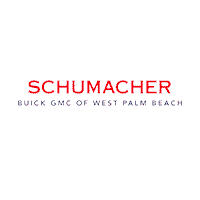 At Schumacher GMC of West Palm Beach, you’ll receive the same upgrade in performance that you can expect in a Denali. Come see our inventory of Denali GMC SUVs and trucks for sale, and get a taste of what the good life is all about.